Into the Inferno – Werner Herzog and volcanologist Clive Oppenheimer travel the globe and visit volcanoes in Indonesia, Ethiopia and even North Korea in an attempt to understand man’s relationship with one of nature’s most violent wonders. Beginning in 2016, the BLM-Price Field Office in conjunction with Arizona State University, Montgomery Archaeological Consultants, USU-Easter, and the Colorado Plateau Archaeological Alliance, initialed a public archaeological project in Nine Mile Canyon with the primary purpose of introducing students and local adult volunteers to archaeology and the importance of conserving cultural resources. 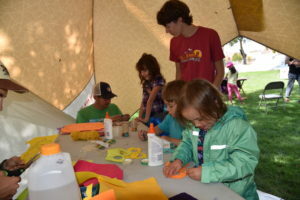 Secondary purposes beyond community engagement include interpretation, stabilization, sustainability of Cottonwood village in the face of increasing tourism and development. The first season of fieldwork occurred in the autumn of 2017 over the course of six three-day weekends. In all, 72 volunteers participated in the program and successfully excavated approximately half of a large pit structure at the site. 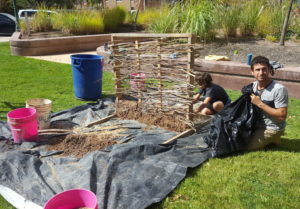 This presentation describes the public archaeology project, highlights some of its successes, and discusses some of the issues involved in these types of large participatory efforts. Join us for a 45-minute driving tour of the US-DOE remediation of the former Atlas uranium mill site along the Colorado River just north of Moab. A project leader will accompany each van to explain how and why the tailings are being relocated, impacts on the environment and site reclamation efforts. Meet at 10 a.m. at the Lions Park Transit Hub. Free Tickets Required – available starting in September at the Moab Information Center or the Grand County Public Library. This social event will give community members the chance to chit-chat with local and regional science figures all while enjoying light refreshments. In case of rain the event will be moved to the library. Nicole Walker, nonfiction editor at Diagram and Associate Professor at Northern Arizona University in Flagstaff, Arizona, will be discussing her new book, Sustainability: A Love Story. Her other books include A Survival Guide for Life in Ruins (to be released soon), Where the Tiny Things Are, Egg, Micrograms, Quench Your Thirst With Salt, and This Noisy Egg. She is a recipient of a fellowship from the National Endowment for the Arts, a notable essayist in Best American 2008, 2014, 2015, and 2016 and nonfiction winner of the Best of the net in 2013 and 2014. 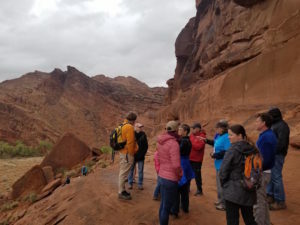 NEW EVENT: William Leggett of the National Park Service will lead a hike along Moab’s Old Mail Trail to discuss how geologic forces forged Moab’s unique landscape. Limited to 20 participants, free ticket available at the MIC or GC Public Library. Take a permaculture walking tour with Dr. Roslynn McCann, Associate Professor of the Environment & Society with USU College of Natural Sciences. Walk from the Sun Court through the CommuniTea Garden to the USU permaculture gardens. Permaculture is an integrative design process mimicking nature in creating resilient and productive landscapes and communities. On this tour, discover how, in a small urban space, you can maximize ecological, food and forage benefits of your landscape while minimizing labor and water use. Specifically, we will explore bee habitat, earthworks, curb cuts, rain tanks, plan diversity and more in USU’s permaculture gardens. If you prefer not to walk, meet at the pergola and upcycled picnic table at 3pm. Learn to identify plants and biological soil crusts with scientists from the U.S. Geological Survey. 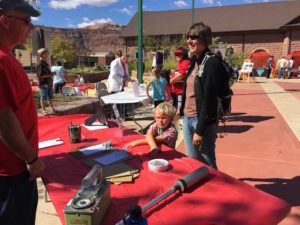 Come listen to a Moab Paleontologist discuss the Mill Canyon Dinosaur Tracksite.